"Yearly renewals for Citrix XenApp and Parallels Remote Application Server"
Who Should Read This White Paper? Existing Citrix solutions users who need an application and virtual desktop delivery solution that is easy to use, low-cost, and can easily scale up to meet their business requirements. 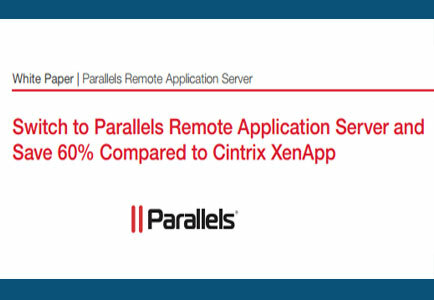 Considered an industry underdog by many, Parallels Remote Application Server has been in the industry since 2005, and many Citrix customers have already switched to Parallels Remote Application Server. This white paper examines how migrating to Parallels Remote Application Server (Remote Application Server) can reduce the costs of an application and virtual desktop delivery solution by 60%.